Aizawl FC's Lalnunfela's scored twice from set pieces to help his team manage a 2-2 draw against, East Bengal FC in a cold night at Salt Lake Stadium. Eduardo Ferreira (66’) opened the scoring for the hosts before Katsumi Yusa (72’) doubled the lead. However, William Lalnunfela (74’ and 90+4’) scored a brace that meant the Red and Golds could only muster one point against the defending champions at home. Kingfisher East Bengal lined up in a 4-2-3-1 formation with goalkeeper Mirshad and defenders Mehtab Singh and Deepak Kumar making their senior national league debuts. Mohammed Rafique wore the armband as Eduardo Ferreira, Armand Bazzaou, Mahmoud Al Amna, Katsumi Yusa and Willis Plaza’s inclusion made for an enviable foreign contingent for Khalid Jamil’s side against his former team. Paulo Menezes preferred William Lanufela to lead the line with Yugo Kobayashi. Avilash Paul had his first taste of the Hero I-League since his Pune FC days and Alfred Jaryan skippered the side in a flat 4-4-2 system. Willis Plaza squandered three opportunities in the first half. Mehtab Singh crossed the ball into the box for the Trinidadian but Plaza was late to react as his first touch failed him in front of the net in the seventh minute. Exactly seven minutes later, the 30-year-old sent the ball straight into the hands of Avilash Paul. Plaza also hit the woodwork from 22 yards out from a solo effort as Plaza’s showing in the box left a lot to be desired. It was only around the half-time whistle that Aizawl got their first sniff on goal as Alfred Jaryan sent a header wide from a corner. However, the second half promised a goal-fest. Avilash Paul was tested thrice around the hour mark but his resolute was broken by Katsumi Yusa’s corner-kick which took Brandon Vanlalremdika nudged towards Eduardo Ferreira and the former Mohun Bagan defender headed home, scoring on debut with his new club. Another goal within six minutes sent the Kingfisher East Bengal fans into a frenzy when Paul could not judge the trajectory of the shot from Mohammed Rafique, taking a major deflection off Katsumi Yusa to double the lead for the Kolkata club. However, that joy was short-lived. Aizawl FC got one back two minutes later as William Lalnufela headed in the ball as Kareem Omolaja guided the ball towards the striker who was unmarked from David Lalrinmuana’s set-piece. Just as the hosts believed they had got the three points in their kitty, there was late drama, much after the stipulated injury time. 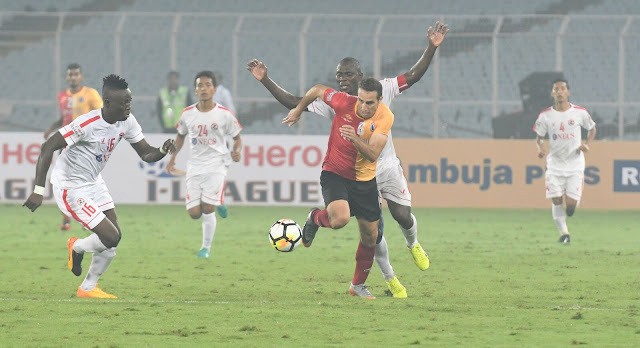 Lalthathanga Khawlring’s flag-kick triggered a goalmouth melee and hero earlier, Eduardo Ferreira failed to clear the ball in front of him and Lalnufela was at it again as his left-footer found the back of the net, breaking Kingfisher East Bengal hearts.